CHADO PRACTICE: Chanoyū la Cărturești - Verona! Lansare de carte! Chanoyū la Cărturești - Verona! Lansare de carte! I needed two helping hands to be able to bring to the Romanian public a book which is different from the rest (just like all the books!) They were generously offered by PAIDEIA publishing house and Cărturești Verona bookstore. the book "Chanoyū - the Japanese Tea Ceremony" will be presented to the public. You are welcome to join the author and friends in a book launching event!!!!! 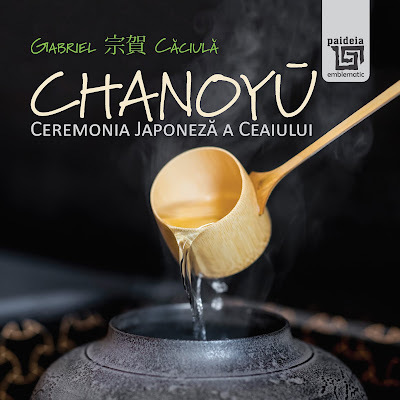 Chanoyū - ceremonia japoneză a ceaiului (o călătorie în lumea imposibilului) is a book which saw the print only when I awakened to the fact that the deep secret behind this tradition remains forever a secret for the non-practitioner and that it cannot be revealed to the public by just sprinkling words on a piece of paper. I wanted to go with the readers into a journey through various doors pretending themselves to open to the Way of Tea and see why this is so. Why beauty and pleasure and craft and skill do not add to much without a serious spiritual readiness. To see why the Secret will remain a Secret for most of us.